With clean lines and sturdy construction, Kraus bathroom accessories provide everyday efficiency with style. 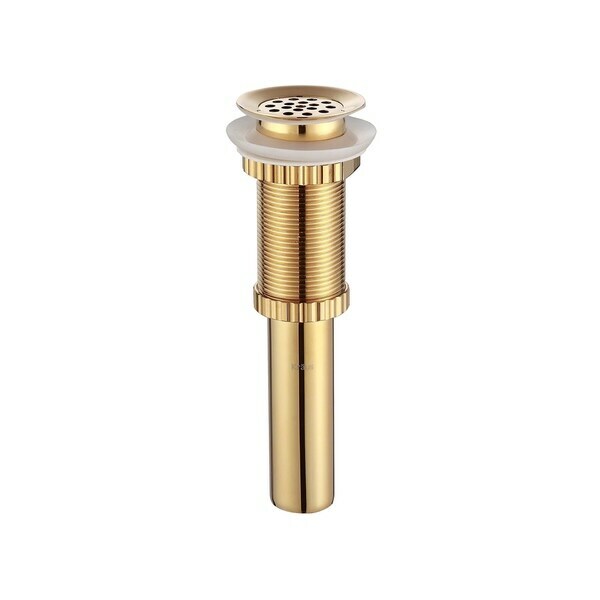 Constructed from brass, the pop-up drain is designed for any above-counter vessel sink without overflow. It is paired with a brass mounting ring designed to work with any vessel sink with a rounded bottom. For easy installation, all required rubber gaskets are included. Choose from four distinctive finishes to match your bathroom faucet and create a beautifully coordinated look. The drain is beautiful. I bought it because I wanted gold/polished brass to match the rest of the fixtures in the bathroom, and, because the vessel has no overflow, I bought the strainer style.Big mistake.The drain and mounting ring are absolutely lovely and easy to install, but I recommend not buying this strainer-style drain for a no-overflow, nonvented vessel sink. They don't allow proper mixing of air and water when the sink drains, and, as a result, the sink drains very, very slowly. (It's a common problem, but one I wasn't aware of.) Anyway, lovely product, well-made, but may cause you problems with slow drains. I installed this with the Kraus Autumn Glass Sink. At first I had problems with leaking around the drain. Even though the instructions did not call for plumbers putty around the drain, I used some and that fixed the problem. The mounting ring is very heavy and much nicer than what I've seen in local stores. Another reviewer mentioned that the grid drain drains slowly. I had the same problem and considered switching to a pop up in the hopes that it would solve the problem. Instead I found a simple solution. I loosened the white drain pipe connections above the p trap and introduced some air. Problem solved! The sink drains just fine now. My husband and I have a vessel sink with a drain hole that is drilled somewhat differently from most that I have seen. I didn't want a pop-up drain because I never wanted the sink to hold water because there is no overflow. We ordered the oil-rubbed bronze color and it is absolutely PERFECT. Kraus makes a quality product an I am thrilled that Overstock had it. You can't beat Overstock for quality & value 99 times out of 100 ! Good quality, a little pricey for what it is. Feel like I could go to Home Depot or Lowes and get something similar for a better price. Works very well with an onyx vessel sink, looks high quality and finish is easy to keep clean. I bought the vessel sink and the faucet, but forgot about the mounting ring and drain. Overstock came through again and had it here before the plumber's appointment. It works and looks awesome! What a deal. This is a well made and sturdy drain, that will look great in my farm sink! I would recommend if you need a new drain or just looking to update the sink to something more modern looking. Fits well with our new farmhouse-style vessel sink in our historic church sacristy. I ordered this to avoid the maintenance nuisance of a traditional pop-up, but the plumber noted that most public building codes now forbid pop-ups anyway, so that was a bonus. I bought this for my vessel sink. It is very high quality and looks great. Just what I needed. I actually didn't use it but the man who got it at our moving sale was thrilled. I got full price for it. There was another drain in the sink set that I had not seen listed. Our plumber said these were excellent quality and installed easily and he is particular. I think they just look really great. I was very impressed with the craftsmanship of the product. Exceeded my expectation. "How long is the threaded part of the drain? Thank you." Threaded part is around 3.5"